Pioneers in the industry, we offer seals & gaskets for oil & gas industry from India. SP: This single acting piston seal is designed for medium to heavy duty cylinder applications. UR: This Single Acting ‘U’ Cup seal is for relatively lower temperatures and medium pressure. CP: This highly efficient piston seal Assembly with 2 side Bearings is for positive sealing with low co-efficient of friction. WR: This wiper ring with or without metal casing is used for prevention of Dust/Dirt/Foreign particles from entering the cylinder. DP: This Robust heavy duty double acting piston seal is cost effective with 2 side bearings. 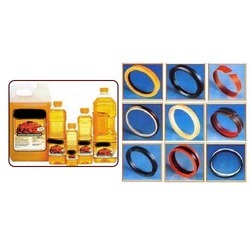 ORBR: Commonly used for stopping leakages with back up rings which prevent extrusion through gaps. Looking for Seals & Gaskets for Oil & Gas Industry ?